Invasive species are introduced species for which there are few to no natural “checks and balances” (such as predators) in the new environment and which consequently thrive in disproportionate numbers, taking over habitat once occupied by native species (species naturally or normally occurring in a country), competing with native species for resources such as food, and in some cases, using native species as food. Some invasive species kill or destroy native species in the process and can cause their eventual extinction. New Zealand is a country which is actively fighting the introduction of new species to their lands. While the U.S. has a Department of Homeland Security, New Zealand has a Department of Biosecurity to protect its natural resources. Hmm...is it possible that the two countries have different priorities? If you arrive by ship, one of the first things that happens is an agricultural inspection in which any fresh produce is confiscated (removing non-local seed sources.) We were warned that “anything with the potential to sprout” such as popcorn, grains, dried legumes, and some spices might also be confiscated in New Zealand. The Department of Agriculture revealed the thoroughness of a typical inspection when they asked us to deposit the contents of our “dust-buster” type vacuum cleaner in the quarantined items bag. 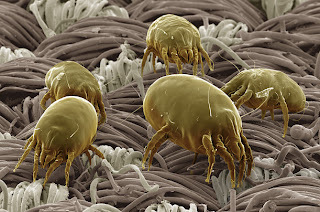 A large component of dust is airborne pollen and spores; there could also be foreign seeds or insect eggs in our dust. 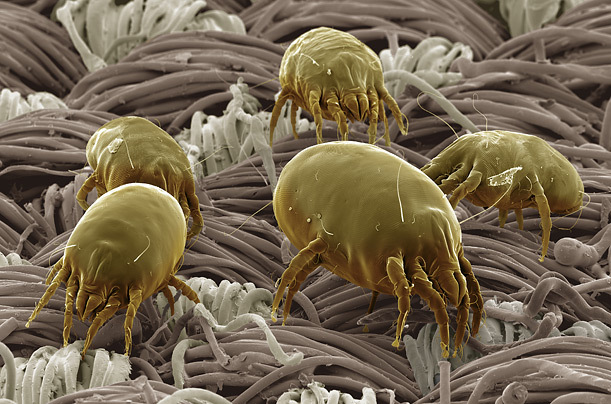 And of course, where there's dust, there are dust mites. Those traveling to New Zealand by air may remember being required to declare whether or not they were carrying any outdoor gear such as tents or hiking boots with them, gear which may also transport unwanted hitchhikers such as seeds or insects. 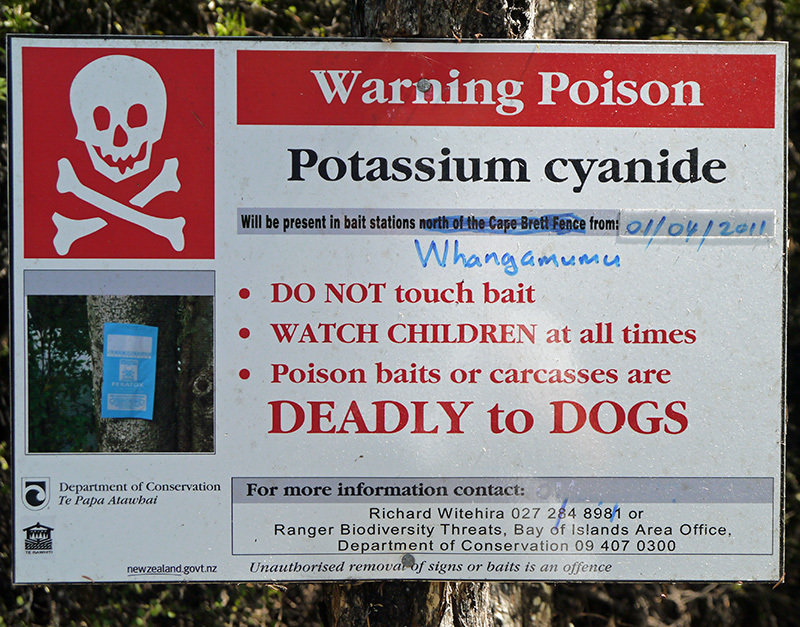 Shortly after our arrival in New Zealand, we began to see other evidence of the country’s active battle against invasive species. 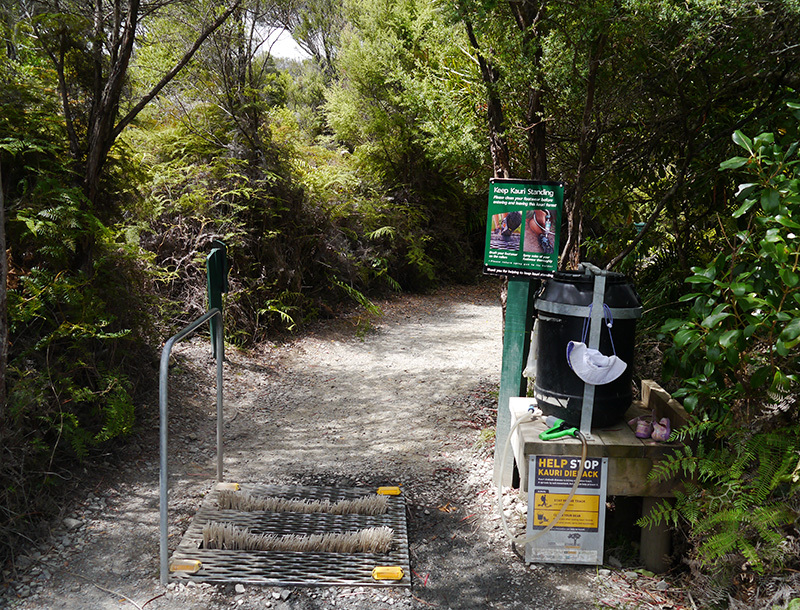 When we visited the Waipoua Forest, we came across this boot-cleaning station at the entrance to one of the trails. The shallow feeding roots of kauri trees are susceptible to disease introduced through fungal spores. We were asked to use bristle brushes and spray hose at this station to clean the bottom of our shoes/boots before entering the forest. I had read a news article about the impact of dogs (an introduced species) on kiwi birds (a bird endemic to New Zealand.) The kiwi is not only a flightless bird; it has a very strong scent. These two characteristics in combination make kiwis extremely easy for dogs to sniff out and capture. 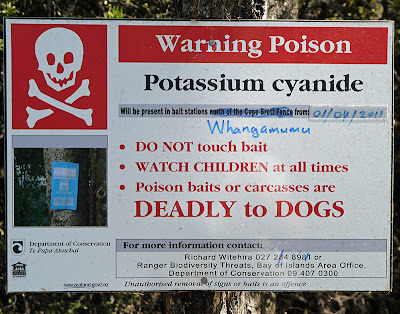 I forget the exact statistic that I read, but a lost (unleashed) pet dog left behind in a forest ferreted out and killed something like 30 kiwis in one week. You can read another statistic about the impact of dogs on kiwis here. Some kiwi protection groups are engaged in less invasive means of controlling the impact of dogs on kiwis, such as providing kiwi-avoidance training for dogs. We first saw large traps like these on Urupukapuka Island in the Bay of Islands. 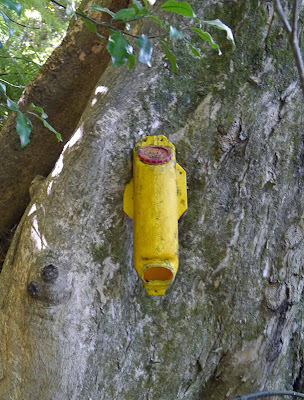 They were labeled “stoat trap” there. A stoat is in the weasel family and is an example of an introduced species that has subsequently wrecked havoc on the native ecosystem. Stoats were introduced to New Zealand to cut down on the rabbit population; however, they also ended up preying on many native species, especially birds. Now they are a threat to many of New Zealand's native birds. Is it a trap or a nesting box? Efforts are also being made to reduce the number of hitchhikers that arrive in New Zealand on boat hulls. Cruisers in Tonga were all advised (by visiting representatives from New Zealand marinas and marine services) to clean their boats before coming to New Zealand. We were told our boat bottoms might be inspected and we may be prevented from checking in to the country if there was too much growth. In reality (at least in Opua), the visibility in the harbor was so bad that no one could see your boat bottom. However, since cruisers typically try to keep their hull and prop clean and free of growth anyway, in order to reduce drag and increase hull speed, most boats would have cleaned their bottoms before the almost 1000-mile passage to New Zealand under any circumstances. In some locations in New Zealand where known invasive species exist in the harbors, there are wash-out bays in place to clean your hull and collect the debris before a boat leaves. 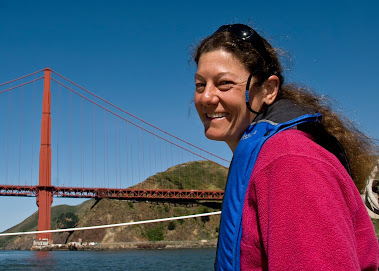 There is also an active educational campaign for “boaties” to keep their anti-fouling up to date to deter the transport of species from one place to the next. Although human visitors do not constitute a separate species, we can be invasive! New Zealanders are as fierce about protecting their country from unauthorized immigrants as from invasive species. New Zealand has free or low-cost medical and dental care for residents due to government subsidies, and its government does not want people retiring to live in New Zealand for that reason alone. The Quantas agent at LAX refused to print my boarding pass without some proof of my return passage, of which I was carrying none. She helpfully got on the phone with an Immigration agent in New Zealand and put me on the line to speak with him. He demanded that I produce proof of my return passage. I told him I was carrying no such proof and asked him if he could suggest something that I could use? In turn, he simply demanded again that I produce proof of passage back to the United States and said that it was my responsibility to produce such proof. As my boarding time got closer and closer, I got more and more panicked as I went around in circles with the Immigration agent a few more times. 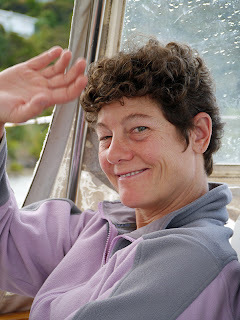 It was looking like the only way out was for me to buy a return ticket to the United States (which I had no intention of using), when the Immigration official finally suggested that an email from my skipper would suffice. 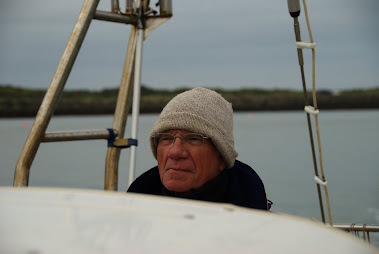 I called Patrick in New Zealand, who immediately sent the Quantas agent an email with our vessel registration number, his name as skipper, a statement that I was crew on the vessel, and our intended departure date. With email in hand, the Quantas agent printed my boarding pass and I made it to the gate with fifteen minutes to spare. The agent (thankfully) printed out a couple of extra copies of Patrick’s email for me to take along with me. Homogenization and Monoculture: Are They Inevitable? As the world becomes a global village (or metropolis? ), one might wonder whether the reduction in biodiversity and the homogenization of culture are inevitable? Back home in Seattle, I was active in forest restoration in our local parks and green spaces because our urban forests are in decline. This volunteer work consisted of removing invasive species such as Himalayan blackberry, field bindweed, English ivy, and Japanese knotweed---at least three of which were preventing the natural cycle of native conifers (such as Douglas fir, western hemlock, and western red cedar) from reseeding themselves---and planting native trees and shrubs in the liberated ground. The young saplings had to be monitored regularly, and the strangling invasive species removed from them, in order to survive to adulthood. 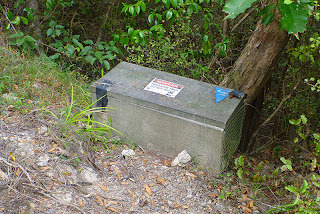 After participating in this volunteer work for several years, I realized that these "invasive species" would never be fully eradicated (as they were being constantly reintroduced through seeds borne on the wind from home-owners' gardens, transient bird and mammal feces, and other sources,) and that it would take constant maintenance to keep our urban coniferous forests free from invasives. Without that constant vigilance and maintenance, it is possible that the remaining species on earth will dwindle down to essentially a monoculture. "Monoculture" technically means one crop or species, but I am thinking of a condition of reduced diversity in which only a few species (adapted to thrive along humans) remain in existence. That reduction in biodiversity would be due to the extinction of countries' specially adapted species due to habitat loss caused by human overpopulation and land use practices, and threats from invasive species to the remaining habitat. Although countries the world over are creating both terrestrial and marine reserves, these isolated "pockets" of green and blue space are more vulnerable to threats to biodiversity than large tracts of land and sea. Part of the theory of evolution states that new species arise under conditions of geographic isolation. Technically, no continent, country, or island is geographically isolated anymore, and the DNA that allows species to thrive in a global environment will become the successful DNA. In North America's urban cities, scavengers such as racoons, crows, and rats and plants whose seeds these creatures help spread such as Himalayan blackberry, are examples of the palette of species we might see. From the human perspective, perhaps the homogenization of culture is inevitable with the advent of the information age and the rapid advance of electronic technology. It will be to our collective loss if the beauty and diversity of the world's unique cultures (languages, dress, dance, song, religions, stories and art) disappear from the planet; but the sad thing is, it is already happening. Languages, like species, are going extinct (a testimony to their "living nature") at a rate of approximately one every two weeks. Citizens in some countries are trying to achieve a higher standard of living---and who are those living in nations that already have a higher standard of living to tell them they can't?---however, in a world of global goods and services and multinational corporations, everything begins to look and sound the same ("homogenization") as that higher standard of living is achieved. While in terms of world peace and human co-existence, the elimination of nation states and the establishment of a world government might be to everyone's benefit, the global village comes at a cost to biodiversity and human culture. This is the challenge of the living in the twenty-first century: How do we make the transition to a global economy gracefully? How can we feed human spirits by ensuring equality in the human family and that everyone's basic needs are met, but also feed our souls by not destroying the diversity, beauty, and wonder in the world? Well-writ, sis. But I'm just here to say that's a nice pic of you!